... $300 million "loan" is a Supplier's Credit deal ... Finance Minister Lied To Parliament? IN THE MOST DISASTROUS public relations blitz on the controversial $300 million loan, Mr Reinze Edwards, President of the CNTCI Limited last Saturday implied that Government misled Job 600 into approving the loan agreement when what they should have sent to Parliament should have been a supplier's credit facility. Speaking on last Saturday's “Newsfile” programme on JOY FM, Reinze Edwards admitted that the $300 million loan agreement approved by Parliament on April 13, 2004 was indeed not a loan agreement. 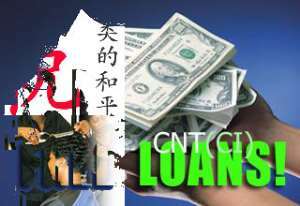 As far as CNTCI was concerned, the agreement approved by Parliament was for no loan. “There is no loan and it's a supplier's credit arrangement” he strangely said of the $300 million loan facility drafted by the Government of Ghana and approved by Parliament. He further added: “We're not a financial institution… we cannot give any loan. We have only made arrangements for a supplier's credit.” The programme, which was hosted by JOY FM newscaster Kofi Abotse, featured JOY FM Head of Talks programme Stanislav Dogbe, Statesman Editor Asare Otchere-Darko, Crusading Guide Editor Kweku Baako and NDC-affiliated social commentator Rojo Mettle Nunoo. According to Reinze Edwards, a real agreement on the issue was expected to be drafted after the approval by Parliament, between Government and CNTCI. He described the “$300 million loan agreement” approved by Parliament as a general document prepared by accountants and not lawyers, on December 3, last year, which was meant to be firmed up later. But the biggest inaccuracies of the day were over documentations he was confronted with, including details of the shareholding structure of CNTCI, which he had provided to the Ghanaian media. Whereas Edwards, through the Ghanaian media, had suggested that his company has 200,000 ordinary shares of 1 Pound Sterling each, he said last Saturday on the programme that the shares were 250,000 valued at 250,000 Pounds Sterling. Interestingly, registration documents from the UK's office for registering corporate entities, Companies' House, as of last week May 25, which he was confronted with, proves that the shares were 100,000 (and valued at 100,00 Pounds) and not what he claimed. The date of registration of the company he gave also conflicted with that of documentation at Companies' House. So did his insistence that they had used the Marlow House address in the UK as their right address during the registration of the company. Indeed it emerged that they have even relocated from their “right address” since November last year.. The Sri Lankan-born UK citizen was also emphatic that he personally had no shares in China Railway Construction Corporation (CRCC) and was also unclear over the shares held by CNTCI in CRCC.